This year, the week of April 8, 2019, is Undergraduate Research Week. On November 16, 2010, the U.S. House of Representatives declared the week of April 11, 2011, as "Undergraduate Research Week." Since that time, CUR has designated a week in April each year as "Undergraduate Research Week." 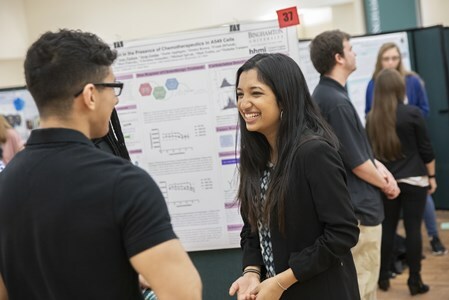 Plan ahead for next year -- Undergraduate Research Week 2020 is April 20-24, 2020. 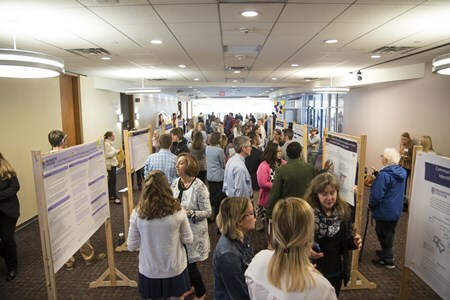 The 11th annual Student Research, Scholarship, and Creative Activity Symposium at Aquinas College (Grand Rapids, MI), will be held on May 1, 2019. This poster session features more than 50 undergraduate researchers from a wide range of academic disciplines. Students' projects are featured on the website http://www.aquinas.edu/student-research/student-research-scholarship-and-creative-activity-symposium. 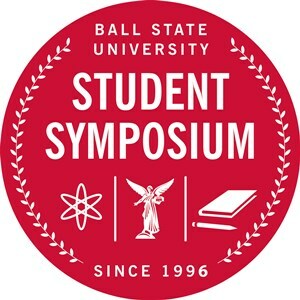 Ball State University (Muncie, IN) is hosting the annual Student Symposium on April 9, 2019. For more than 20 years, the Student Symposium has provided graduate and undergraduate students with an opportunity to present their scholarly work while gaining valuable insight from faculty and staff judges from across the university. The symposium encourages interdisciplinary discourse, allowing students to learn from their peers and mentors about engaging topics. The 2019 Student Symposium is being held during #OneBallStateDay, 24-hours of campus-wide engagement, and will host 140 poster presentations, 35 oral presentations, 240 participants, and 80 faculty mentors across all seven of the university's academic colleges. 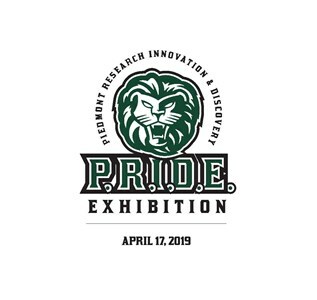 Each spring, Binghamton University sponsors Research Days. Faculty members, academic departments and programs and student groups plan events related to research. The schedule includes open labs, seminars, poster sessions, tours, speakers and more. The week culminates with two Student Research Poster Sessions featuring more than 180 posters and more than 340 students. 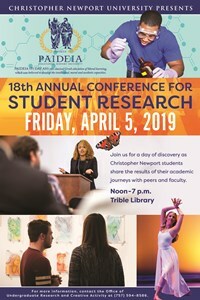 Christopher Newport University holds its 18th annual Paideia conference for student research on April 5, 2019. Nearly 300 students will present research and creative work in nearly 50 oral presentation sessions, 90 posters, 2 art shows, and 1 performance. The day concludes with a keynote address by noted physicist Brian Greene of Columbia University. On April 12. Eastern Connecticut State University will be holding its annual CREATE (Celebrating Research Excellence and Artistic Talent at Eastern) Conference. This annual event will showcase student research and creative activity undertaken within the School of Arts and Sciences and the School of Education and Professional Studies. Parents, friends, alumni, corporate representatives, as well as faculty and staff from graduate and professional schools, attend this event. Every year, approximately 300 students from across disciplines participate in the conference. Conference webpage with photos: http://www.easternct.edu/create/. CURFIU is an undergraduate research conference open to ALL FIU undergraduates. This is the largest multidisciplinary research conference at FIU with presentations from all disciplines, including but not limited to STEM, social sciences, humanities, and the arts. CURFIU features presentations, posters, and workshops by top student and faculty researchers at FIU. Presenters and guests have the opportunity to meet with potential employers as well as postsecondary institutions from around the globe. This conference is free and open to the public with cash prizes awarded to the best presentations. This year’s conference will be on April 8 at the FIU Wellness & Recreation Center located on the FIU Modesto A. Maidique Campus. 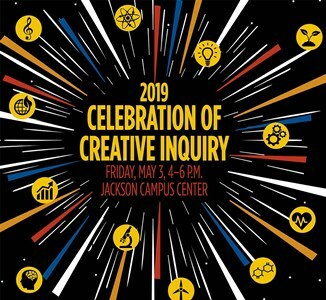 On May 3, Gustavus Adolphus College (St. Peter, MN) will host its annual Celebration of Creative Inquiry poster session. Undergraduate students across academic disciplines highlight their achievements in research, scholarship, creativity, and dialogue. High Point University will celebrate creative and scholarly works in its campus symposium, High Point University Research and Creativity Symposium (High-PURCS) on April 16. This year High-PURCS will include 192 undergraduates showcasing 152 projects from 29 different disciplines representing all 8 schools. Nearly 20 percent of presenters are undergraduates. 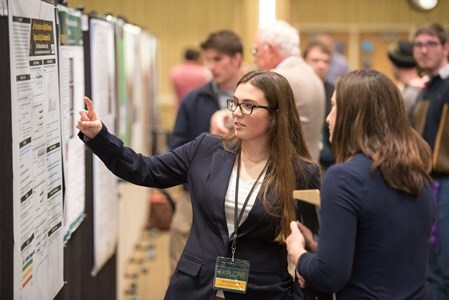 On Friday Afternoon, April 12, Hope College in Holland, MI, will celebrate student research with its 18th annual Celebration of Undergraduate Research and Creative Activity. This event draws more than 800 visitors a year. This year, more than 300 students will descend on the DeVos Fieldhouse to present more than 200 posters and projects from 28 departments or programs, representing all divisions of the college. Members of the public are welcome. On April 10, the Centre for Undergraduate Research Learning (CURL) at Huron University is hosting the 3rd annual CURL Conference. The conference will feature lightning talk and poster presentations from student researchers, a keynote address from Lynne Honey (MacEwan University) on the value of research as transformative experiential learning for undergraduates, a faculty/student panel discussion reflecting on collaboration and the undergraduate research experience, and the presentation of student Summer Research Fellowship awards. The day will end with a reception celebrating student research with the launch of the 2019 edition of Huron’s undergraduate research journal, the Liberated Arts. 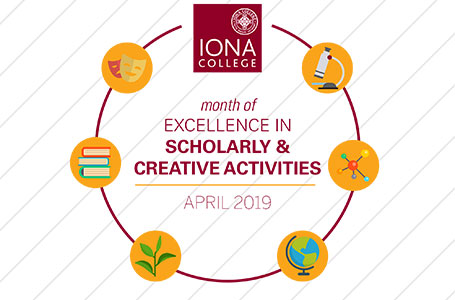 Iona College, New Rochelle, NY, is proud to announce the launch of its Month of Excellence in Scholarly & Creative Activities this April. Featuring more than 30 events, including performances, lectures, presentations, and more, the month-long event is a showcase and exhibition of faculty-student achievements and accomplishments in academic research, performing arts, and creative work across a variety of disciplines.The Iona Month of Excellence in Scholarly & Creative Activities is an expansion of Iona Scholars Day that celebrates its 10th anniversary on April 9. It will feature 131 presentations, in the forms of panels, posters, videos, visual arts, and music & dance, by more than 160 student presenters who are mentored by 50 faculty member from 30 departments and programs. This year's celebration will include a "Nanoscience Symposium" with three invited speakers in the field to introduce students to diverse aspects of nanoscience and its applications for the future. 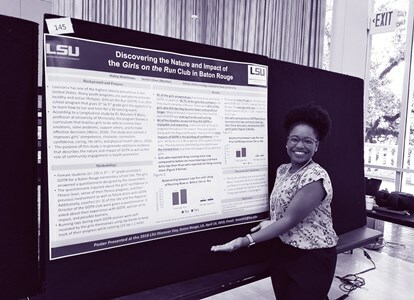 Johnson C. Smith University's Smith Institute for Applied Research and the Ronald E. McNair scholars program have teamed up to provide undergraduate students and faculty with a fun 2019 CUR Undergraduate Research Week Celebration on April 8-12. 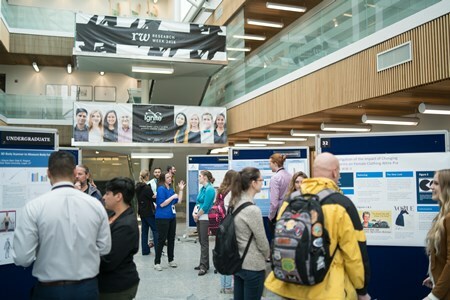 The week will feature a student research poster competition with cash prizes, a faculty research symposium, a student research resource mash-up that will include demos of the James B. Duke Memorial Library Makerspace, and a research speed mixer and awards ceremony in the STEM Innovation Center. 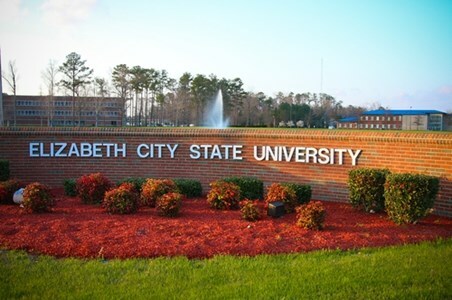 For full details, please visit https://smithinstitute.jcsu.edu. The LSU Discover undergraduate research program will host the inaugural LSU Undergraduate Research Week this year on April 5-12. This week will feature events in which students can showcase their work, learn about research opportunities on campus, and tour research facilities. The featured event of this week will be the 6th annual LSU Discover Day student symposium, a multidisciplinary event with poster and oral presentations, panels, a juried art show, and performances. 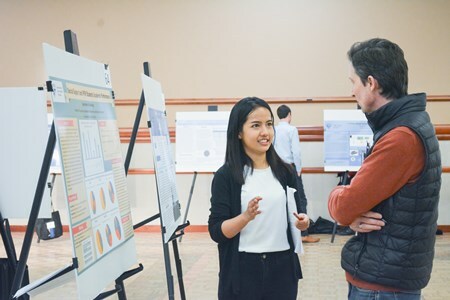 A celebration of undergraduate student research and creativity and faculty mentors will be held on April 10 2019, in recognition of Undergraduate Research Week. Please join us. There will be posters and presentations, creative works and a panned of students and multidisciplinary faculty will share experiences and opportunities. We will celebrate Excellence in Undergraduate Research Mentoring. We will also recognize undergraduates who have participated in research experiences and other scholarly activities during their undergraduate academic tenure at North Carolina Agricultural and Technical State University. Symposium presenters will be awarded certificates of attendance. On April 11, North Dakota State University is hosting the fifth annual NDSU EXPLORE event. NDSU EXPLORE is a program that encourages and celebrates the scholarly accomplishments of NDSU undergraduate students. 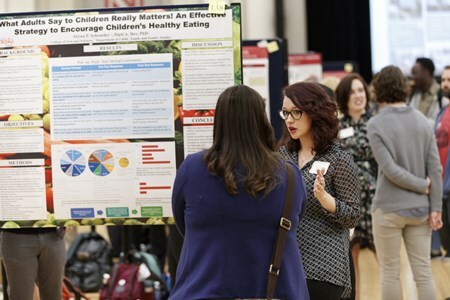 Students present their research and creative posters and oral presentations to an audience of fellow students, faculty, staff, and the public during the event. All undergraduate students majoring in the sciences, engineering, business, arts or humanities are encouraged to participate to obtain experience and to enrich their academic experience. NDSU EXPLORE is administered by the NDSU Office of Research and Creative Activity. 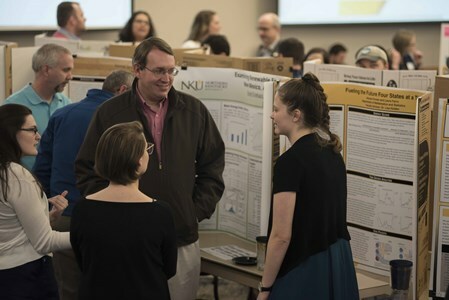 Northern Kentucky University will showcase student research during their annual Celebration of Student Research and Creativity on April 9th. The full day event includes 200+ poster presentations, over 40 oral presentations, and 9 creative performances. A full listing of events can be found at our website: nku.edu/Celebration. 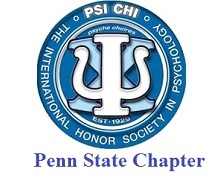 Psi Chi: PSU Chapter at University Park will be hosting its Annual Undergraduate Research Conference on Thursday, April 11, 2019, from 2-4:30 pm in the Moore Building Lobby. 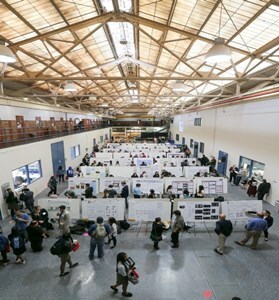 Psychology faculty will be judging both empirical and conceptual research posters. Visitors welcome! 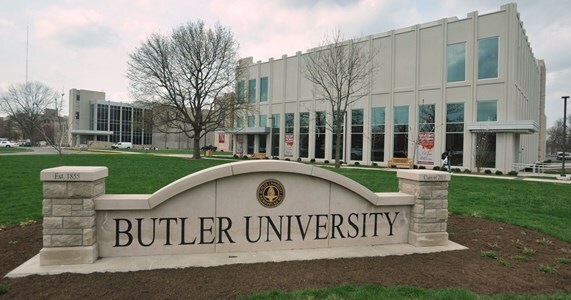 The 22nd Annual Student Research and Creative Endeavor Symposium at Purdue University Fort Wayne will be held on Friday, April 12, 2019, and will showcase more than 70 student poster presentations across a range of disciplines, including the humanities, sciences, social sciences, and the arts. 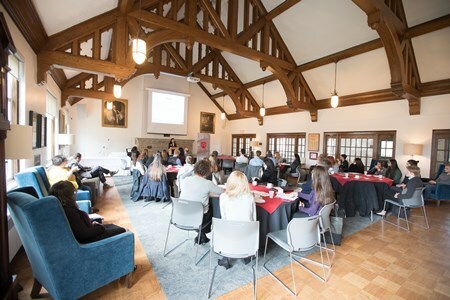 In the months preceding the event, students work with a faculty mentor, receive feedback through an abstract review process, and attend a preparatory workshop. On the day of the event, students present their posters to teams of faculty judges, and six outstanding posters, in both undergraduate and graduate categories, receive awards with cash prizes. The 6th Annual Rocky Mountain College Student Symposium will be held April 10, 2019. The symposium will feature scholarly works from students across campus, showcasing their work as short lectures, posters, demonstrations or exhibits. The Siena College Academic Showcase on April 26 will build upon past successes and for the first time will be a day-long, campus-wide exhibition of academic pursuit and achievement celebrated by the entire Siena community. 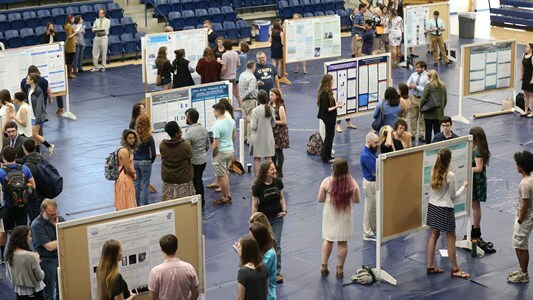 More than 150 students across all academic disciplines will display their 2018-2019 research in poster-form; scores of students and faculty will speak during more than 40 themed presentation sessions throughout the day; and seminars, performances, and honor society inductions will be held concurrently throughout campus. All students, faculty, and staff will be highly encouraged to join in the celebration and learn from their peers. Parents and friends of the college are welcome to attend the event and celebrate the work of students. 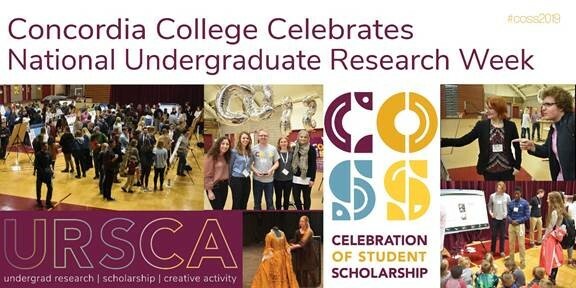 At St. John Fisher College in Rochester, NY, student research will be celebrated throughout April through multiple events where students will share their scholarly and creative work. The largest event is the all-campus Student Research and Creative Work Symposium that will feature the work of more than 300 students across the disciplines. During Undergraduate Research Week this year, the SMCM Office of Marketing, Strategic Communications & Web Services will highlight several ongoing undergraduate research projects and celebrate recent successes in the SMCM newsroom and via social media using the hashtag “#urw2019”. Posts will direct readers to SMCM’s recently updated undergraduate research webpage. 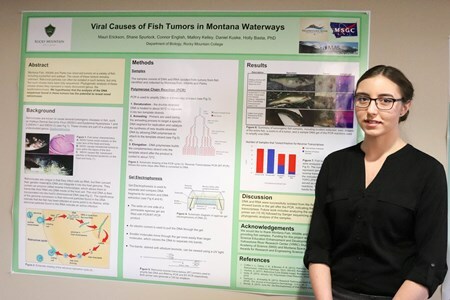 SMCM students are gearing up to showcase their St. Mary’s Project presentations and posters on April 29-30, 2019. The St. Mary’s Project—the most popular undergraduate research opportunity—is a culminating project of original research, scholarship, or creative performance undertaken in the fourth year. Many students jump-start their work with eight weeks of intensive scholarly or creative work during a Summer Undergraduate Research Fellowship on campus. 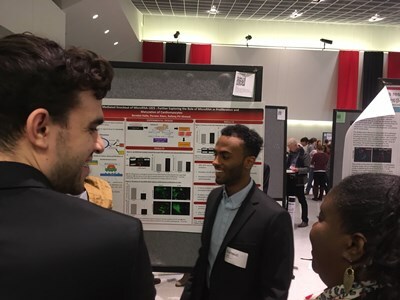 At UC’s Undergraduate Scholarly Showcase, hundreds of students from across the university share findings, revelations, inventions, and interpretations of the world we live in. 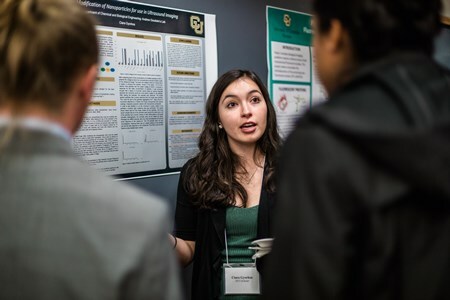 The Scholars Conference showcases the research, scholarly and creative work conducted by the Norlin and Boettcher Scholars at the University of Colorado Boulder in a multi-modal format featuring posters, oral presentations, creative exhibits and performances. The Norlin and Boettcher Scholars are a diverse, interdisciplinary community of two-hundred talented undergraduates of all classifications. The University of Detroit Mercy will celebrate undergraduate research week by having different themed days to draw attention to undergraduate research and researchers. Undergraduate research week will culminate with the 13th annual Celebration of Scholarly Achievement where undergraduate scholarly and creative activity across the university is highlighted with a poster symposium and exhibit. This event allows students to learn more about their chosen discipline and contribute to its body of knowledge. 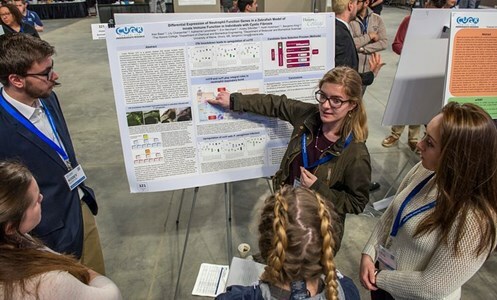 The University of Florida is celebrating Undergraduate Research Week across campus, kicking off the celebration with its 20th Annual Spring Undergraduate Research Symposium on April 4. This year’s symposium includes more than 350 student posters, 6 CURE class presentations, 4 live performances, and a keynote address honoring 20 years of undergraduate research delivered by university president Kent Fuchs. Other events will be held daily, in more than 15 different colleges or centers on campus, on April 5-12, including dance showcases, lab tours, demonstrations, workshops, and faculty panels. The Undergraduate Poster Session at the UNL Spring Research Fair will showcase over 250 undergraduate students with their research posters and creative exhibits on Monday, April 15. 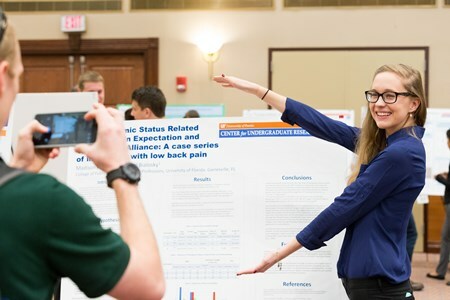 With support from the academic Colleges, there will be a poster competition at the Research Fair with the best posters awarded college monetary prizes and campus-wide recognition. 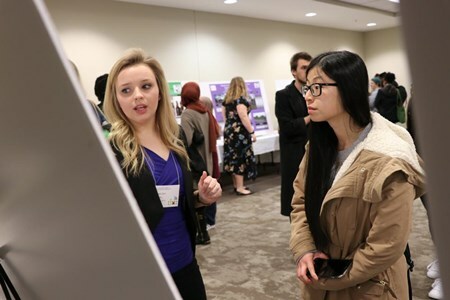 Additionally, over thirty undergraduate students will participate the Undergraduate Research at the Capitol reception and poster session on Tuesday, April 16. State senators will meet students from their home districts to gain a fuller perspective on the importance of undergraduate research and creative activity to the state of Nebraska. Following the poster session, the posters will be on display for two weeks in the Nebraska State Capitol rotunda. 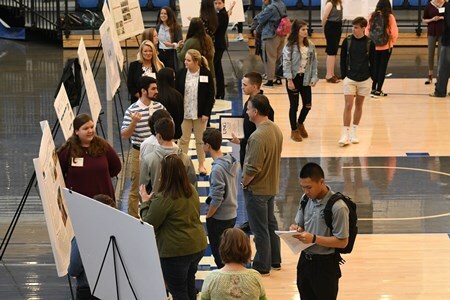 On March 22nd, UNG hosted its 24th Annual Research Conference showcasing research and creative activities from all disciplines across its five campuses. 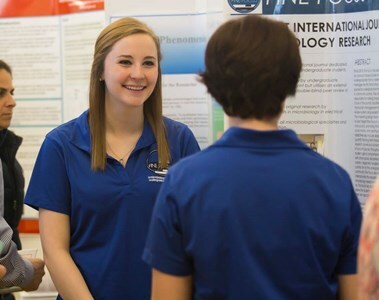 Each year, UNG hosts more than 100 student presentations in both oral presentation and poster formats. On April 10, 2019, the University of Saint Joseph will be holding its 24th Annual Symposium Day. 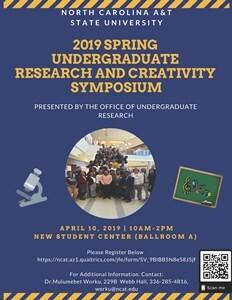 This event showcases undergraduate research and creative activities from more than 100 students in 13 different disciplines and includes oral presentations, poster presentations, and the display of creative works. A Student/Faculty Research Roundtable also is scheduled, where students of all levels can explore research happening on campus by visiting different tables and speaking one-on-one with faculty members conducting projects. The final program, as well as videos and pictures from the event, will be showcased on the university's website. 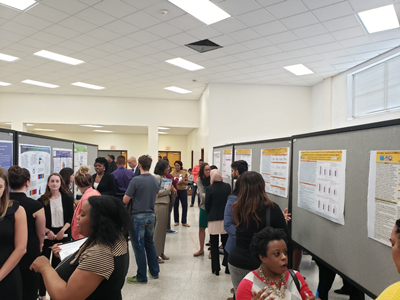 In celebration of undergraduate research, the University of the Sciences in Philadelphia conducted a three-day CUR Undergraduate Research Festival. Events included an "Images of Research and Scholarship" Exhibit-Competition, "Two-Minute Elevator Research Talk" Competition, “Research Speed-Meet” (5-minute speed dating between faculty and potential research students), an Alumni Career Research Panel, CUR Recognition Lunch, and its 7th Undergraduate Research Symposium that featured four research talks and a research poster session that included USciences students and participants from Philadelphia area colleges and universities. The Undergraduate Research Symposium at the University of Utah will be held on Tuesday, April 9, 2019. 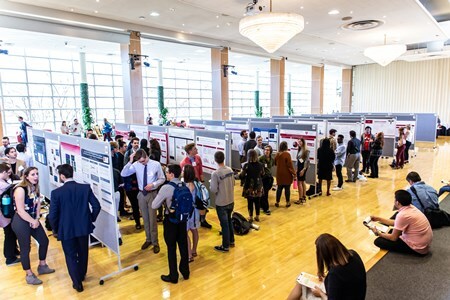 Each year, hundreds of the university’s students from all disciplines present their research or creative work in a scholarly setting to students, faculty, and other members of the University of Utah community. Scholars Day at Wesley College is an annual signature event that started in 2007. The Scholars Day festivities provide an opportunity for students to showcase and celebrate their academic achievements from the past year. In addition to the Wesley students, Scholars Day is a venue for some other colleges and organizations to showcase their work. Representatives from Delaware Technical Community College, Christiana Care Health Systems, and Rutgers University will be presenting research findings. This year, Scholars Day will be held on Thursday, April 18, 2019. Students, peers, families, faculty, staff, and community members are invited to attend and participate. This year, 61 interactive poster presentations, 24 formal oral presentations, 1 photography exhibit, and a community vertical garden will be showcased. On Friday, April 5, 2019, Westmoreland County Community College will be celebrating undergraduate research week by hosting presentations from students and faculty members at the college. Faculty, staff, and students will be invited to hear NCUR presentations, view posters, and listen to various presentations from faculty members.